Succulent poaching is on the rise, CDFW officials say. 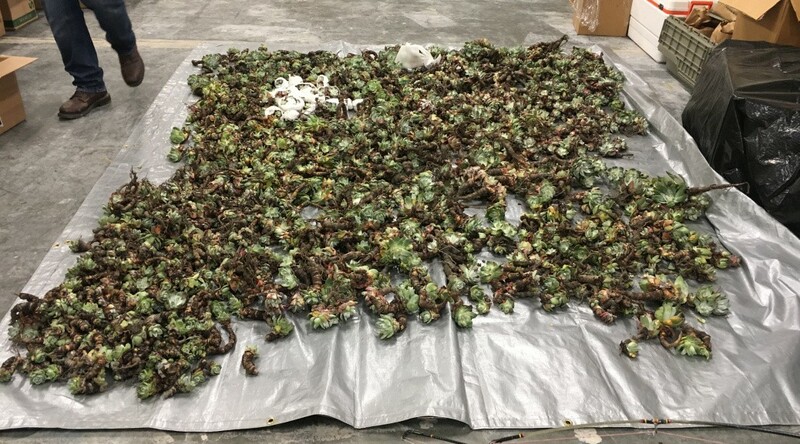 Three poachers who operated an international smuggling ring that shipped succulents from Humboldt County to the Asian market have pleaded guilty to felony and misdemeanor charges, including conspiracy and stealing plants from public lands. According to a California Department of Fish and Wildlife press release, the trio — Liu Fengxia, 37, of China, and Tae-Hun Kim, 52, and Tae-Hyun Kim, 46, both from Korea — were shipping the hardy Dudleya plants worth $40 to $50 a piece to a network of overseas buyers. Judge John T. Feeney suspended the nearly four-year sentences he handed down to each of them “with the conditions that the defendants are prohibited from entering the United States without prior authorization of the federal government and state courts, and prohibited from entering any local, state or national park,” the release states. The succulent pillaging outfit was uncovered with the help of an annoyed patron who became suspicious of a man holding up the line at a small Mendocino County post office by sending dozens of boxes out of the country in December, claiming they contained something valuable, according to a San Jose Mercury News story. That tip led to an extensive investigation involving CDFW officers, U.S. Customs and Border Protection and U.S. Postal Service inspectors, which linked back to the trio. 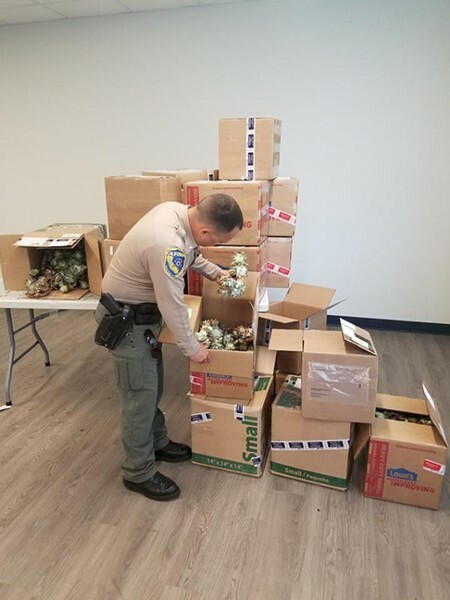 In April, wildlife officers intercepted and seized 1,334 of the plants in boxes being prepared for overseas shipping and found another 1,000 Dudleya after serving a search warrant on the defendants’ hotel room near Trinidad, along with more than $10,000 in cash. Read more here. A wildlife officer inventories some of the 2,300 Dudleya succulent plants recovered near Trinidad. Along with fines of $10,000 each, the three are also being required to forfeit the seized cash to the CDFW as restitution, which “will be used specifically for the conservation of Dudleya on public lands in Humboldt County,” according to the release. "Together with prosecuting Deputy District Attorney Adrian Kamada and the Humboldt County District Attorney's Office, we hope this conviction and sentencing will send a message to those who may consider poaching California's precious natural resources to sell overseas for personal profit," said David Bess, CDFW deputy director and chief of law enforcement, in the announcement of the pleas. The recovered succulents were returned to nature by a team of volunteers and parks empoyees. See previous coverage here. Volunteers and Redwood National and State Parks representatives replant the stolen succulents in April. 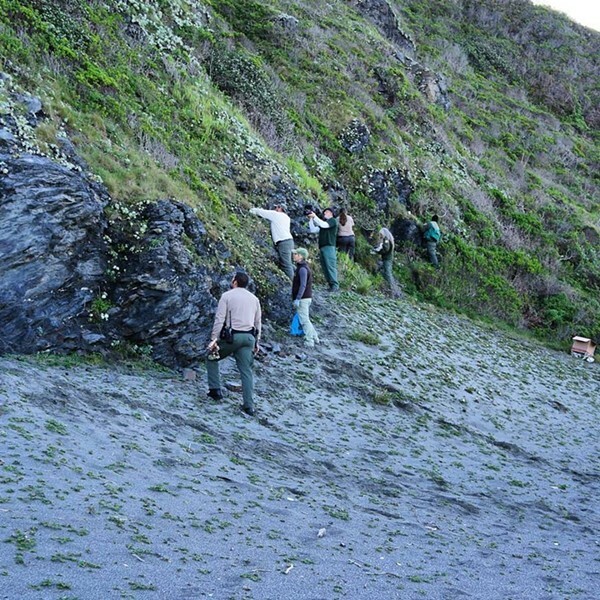 Three defendants in a succulent plant poaching case out of Humboldt County have each pled guilty to two felonies and other misdemeanor charges, the California Department of Fish and Wildlife (CDFW) and Humboldt County District Attorney's Office announced. Felony convictions included conspiracy and false filings with the government, and misdemeanor convictions included removal of plant material from public lands and commercial sales of plants removed from public lands. "Together with prosecuting Deputy District Attorney Adrian Kamada and the Humboldt County District Attorney's Office, we hope this conviction and sentencing will send a message to those who may consider poaching California's precious natural resources to sell overseas for personal profit," said David Bess, CDFW Deputy Director and Chief of Law Enforcement. The case developed from a tip from a member of the public who saw something amiss. Anyone who believes they are witness to unlawful poaching or pollution activity is encouraged to call CalTIP, CDFW's confidential secret witness program, at (888) 334-2258 or send a text with the tip411 app. Both methods allow the public to provide wildlife officers with factual information to assist with investigations. Callers may remain anonymous, if desired, and a reward can result from successful capture and prosecution.